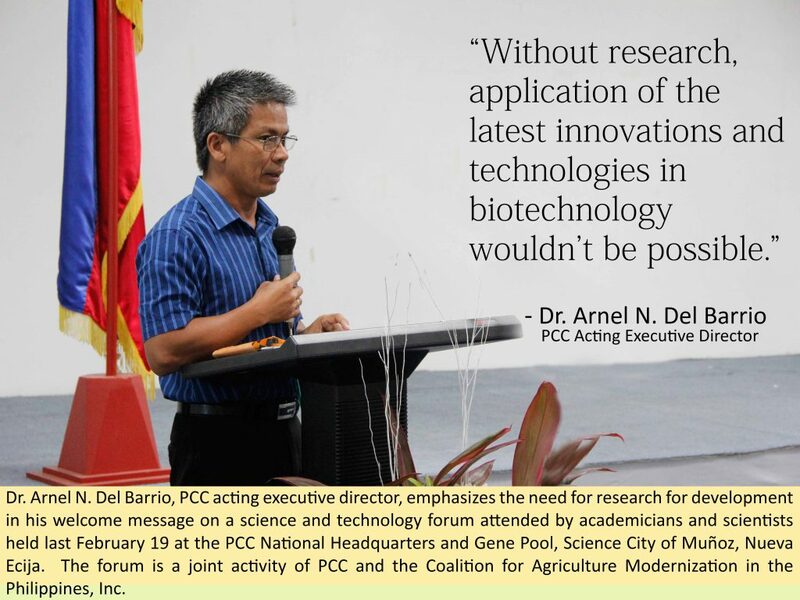 Dr. Arnel N. Del Barrio, acting executive director of the Philippine Carabao Center (PCC), emphasized this need for research for development in his welcome message on a science and technology forum held last February 19 at the PCC National Headquarters and Gene Pool, Science City of Muñoz, Nueva Ecija. Said forum is a joint activity of PCC and Coalition for Agriculture Modernization in the Philippines, Inc. (CAMP), which is a non-profit organization comprised of individuals using their time and money to help improve agricultural outputs in the Philippines. Dr. Ruben L. Villareal, National Academy of Science and Technology (NAST) academician and former chancellor of University of the Philippines (UP) Los Banos, initiated the conduct of forum which was hosted by PCC. “My motivation is very simple and that is to modernize Philippine agriculture. Since this is a big science community, if we attract some of you to become members of this CAMP I think we’ll be doing something great for our country. If through this forum, you will have clear understanding on biotechnology, you will be convinced to serve the country by joining the CAMP and at the same time you will apply for the science career system then I would say that our mission of coming here is not in vain,” Dr. Villareal declared. 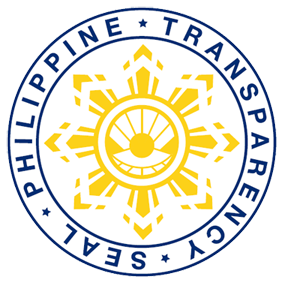 The principal purpose of the forum was to tackle current issues on research and development (R&D) in the Philippines. Among these are: Understanding the Supreme Court Ruling on BT Eggplant and Its Implication to Biotech Programs, which was presented by Dr. Eufemio T. Rasco, NAST academician and former executive director of the Philippine Rice Research Institute (PhilRice); and Modernizing the Philippine Agriculture presented by Dr. Benigno D. Pecson, CAMP president and former president of Biotech Coalition of the Philippines. “We want to understand the Supreme Court ruling on BT eggplant because here in the Science City of Muñoz we are working on biotechnology but not necessarily on genetically modified organism (GMO) thus we want to understand the possible implication of this to our R&D program,” Dr. Del Barrio said. Dr. Rasco’s presentation discussed the recent decision of the Supreme Court was to permanently stop research on Bt eggplant, declaring DA Administrative Order No. 8 (AO8) null and void, and temporarily stopping the whole range of activities on research, development and utilization of GMO technology. This decision, according to him, will tend to perpetuate existing hazardous practices for agricultural pest control. Whereas, AO8 has a proven record of safe and effective use for the past 12 years. Because of AO8, the corn, livestock and poultry industries have become globally competitive, and the farmers’ incomes have increased. “This activity will give us clear understanding on the recent issues and challenges of the R&D programs that might somehow affect the development of the agriculture industry,” Dr. Del Barrio stated. The CAMP urges the Supreme Court to review its decision and allow Bt eggplant research to continue, considering that its assumptions are outdated and its information are based purely on ideology. The coalition also calls on the Supreme Court to allow AO8 to remain in effect until a new set of rules for GMOs is formulated so that R&D and utilization of GM technology can continue without interruption. A quick presentation of biotechnology programs delivered by the different biotech coordinators of research agencies in the Science City of Muñoz such as PhilRice, Bureau of Fisheries and Aquatic Resources, Central Luzon State University and PCC was also part of the forum. Other guests who attended the forum were Dr. Calixto M. Protacio, executive director of PhilRice; Dr. Roger V. Cuyno, secretary of CAMP and former chancellor of UP Mindanao; and Dr. Libertado C. Cruz, NAST academician and former executive director of PCC. The forum was participated in by more than 60 researchers from various research institutions in the Science City of Muñoz, Nueva Ecija.